The second of this year’s Top 100 lists has just been posted online, this one focusing on the Top 100 Cellar Selections from the editors of Wine Enthusiast, based on reviews published during the past year. Inevitably, some – if not most – of these wines will be difficult to find. But the notes point the way to those producers whose wines are deemed cellar-worthy, and it’s a good bet that they will remain so in subsequent vintages. So... what makes a wine a Cellar Selection? Well, as the magazine's introduction states, “since most of these ageworthy wines come from established regions and top vintages, the emphasis is on quality, not value.” But that is not to imply that they are over-priced for what they deliver. Designating a wine a Cellar Selection is an option that those of us who review and score wines for the magazine take very seriously. For myself, I look for wines that are not only at the top of any list of their peers in terms of QPR, but also exceptional reflections of the vintage, the place, and the grape(s) from which they have been crafted. I maintain a cellar deep in NW wines, and frequently pull out older bottles to see how they are faring. That provides insight when I’m tasting a young wine from a just-released vintage. Again, certain producers, and certain vineyards, are most likely to cellar well. I want wines that are balanced, expressive, detailed and complex, and I want them to be drinking well upon release. The fact that they are Cellar Selections does not mean you should put them away for some indefinable period of time until they are “ready” – generally they are ready to be enjoyed upon release. They will change and evolve over time, and there will be more discoveries to be made about them. But the real pleasure can be found in having at least a few bottles of each, so you may taste them at various stages of life. The full list of all 100 wines may be downloaded as a PDF here. As far as the Pacific Northwest is concerned, this region once again far outperforms others that are much larger. 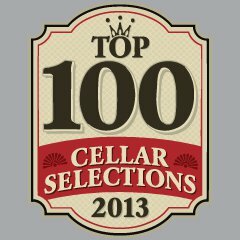 Here are the Cellar Selections from Oregon and Washington in this year’s Top 100, 16 in all, with their overall rank, and my scores, listed as well. Two NW wines placed in the top 10; six in the top quartile! There were two Syrahs, two Cab/Syrah blends, three Pinot Noirs and one Riesling. Congratulations to all the wineries and winemakers represented here. It’s a tribute to their talent, effort, and the region that so many find their way onto these Top 100 lists, year after year. One more list to go – the final Top 100 Wines of the Year. Stay tuned! Will you be doing your top 100 Washington wine list this year? I got a lot of use out of the 2012 list. I'm going to do something at the end of this month, but probably a bit different from the PG Top 100 that ran so successfully in the Seattle Times. Keep watching this blog!